Occasionally, we see a naive question, which requests a value comparison between pages (static pages), and posts (dynamic pages). What are the advantages of using a page, instead of a post? That question, worded in that vague way, cannot be answered. The various differences between pages and posts can provide advantages, or disadvantages. To evaluate a page or a post as an advantage, one must know the specific needs of the blog in question. Long ago, Blogger blogs consisted simply of posts, displayed using the static Classic template. Archives gadget (Date sequenced post index). Labels gadget (Topic sequenced post index). Main page display (Date sequenced aggregated post display). Other posts could be located, only one post at a time, by following a link in "Previous Posts", from post to post - or directly, from any links in the posts. With blogs published to Classic templates, important posts were directly accessed using in post links, intentionally added as the posts were composed. 2007: Layout templates were offered. In 2007, Blogger added the dynamic Layout templates. Instead of displaying the most recent post as the blog home page, they gave us the main page display, to display a sequential array of recent posts. Instead of the "10 Previous Posts" index, they gave us a true "Previous Posts" index, renamed "Archives", which indexed all posts in the blog. All posts could be accessed, using either the Archives index - or by following the main page display links ("Newer Posts" / "Older Posts"), located at the bottom of each main page display segment. 2010: Static pages were offered. Some blog owners, enjoying their blogs with the new Layouts templates and the Archives index, demanded special blog posts that were not indexed in the Archives gadget, and could be "hidden" from their readers. Remember that all posts, using the Classic templates, were "hidden" - excepting important posts, directly accessed using in post links. To satisfy this new requirement, Blogger added "pages", special posts that are accessed only when linked, intentionally - never in archives, label searches, main page displays, or newsfeeds. During the same time period, they added "Jump Break", which gives us the ability to collapse posts displayed on dynamic index pages, a feature not available on static pages. Newsfeeds were relevant here, because indexing of blog posts uses a sitemap - and Blogger blogs previously used the blog posts newsfeed as the sitemap. 2010: The Pages index gadget was offered. Shortly after adding the "pages" feature, Blogger added the "Pages" gadget, to provide an easy to setup index for important pages and posts. The term "pages" became used by many blog owners, to refer to both "ordinary" posts (aka "dynamic" pages), and "special" posts (aka "static" pages) - since both classes of "posts" could be accessed using the Pages gadget. 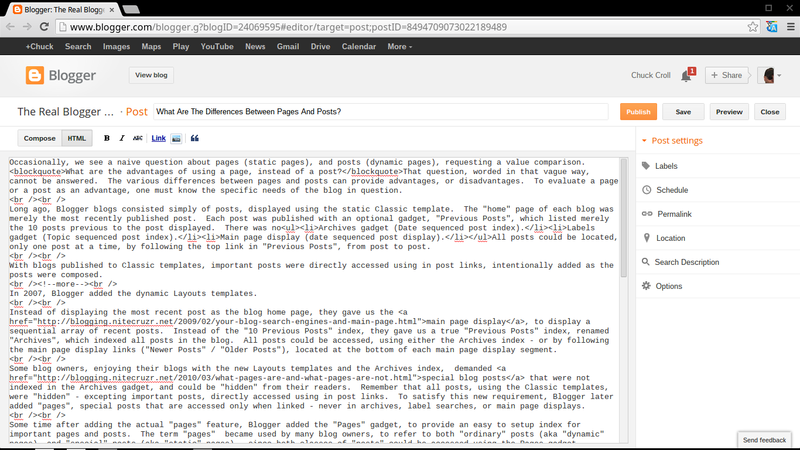 The Pages and Posts editor have similar layout and options sets. The confusion between "pages" and "posts" is intensified, because the edit wizards for each feature have a common overall display layout. Those blog owners not knowledgeable about "pages" design may confuse the "page editor" and the "post editor" - and continue to refer to everything as either "pages" or "posts". Another, more subtle topic of confusion is that "main page" is normally composed of posts. Pages do not show in a normal "main page" display. It may be possible to use a single static page, as the main page, if you wish. This blog article, composed in the Page Editor. 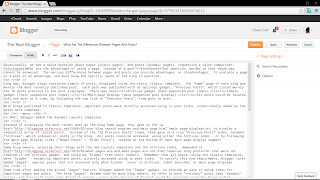 Are created using the page editor, accessed from the dashboard Pages wizard. Are edited using the page editor, accessed using the dashboard Pages wizard, or the QuickEdit icon on the blog face. Are not relevant to the date when published. Won't display author, author profile, date, or time stamp - even if selected, using "Configure Blog Posts". Cannot be scheduled, to publish in the future. Cannot be properly created with a blank title - though malfunctioning Blogger code has occasionally allowed pages with blank titles, a mistake which has caused other problems with pages. Cannot be created with a custom URL. A Page URL is rigidly based on page title, when published. URL Duplication prevention for pages is not understood. Cannot be created or maintained, by blog authors. Static pages are the responsibility of blog administrators. Cannot use "Jump Break" in a summarised index (main page display). Are now unlimited, per blog. Each blog can have an unlimited number of static pages. The former limit, of 20 pages / blog, was lifted in 2014. Can contain one single blog article. Do not appear in archive indexes, label searches, and main page displays. Appear in blog newsfeeds - but not in BlogSend email. Appear in the pages sitemap - and are optionally indexed by the search engines, or as intentionally linked by the blog owner. Cannot use "Jump Break" in a summarised index (archive, label, or main page display). This blog article, composed in the Post Editor. Are created using the post editor, accessed from the "New Post" button, located in the Navbar, or in the dashboard Posts List display. Are edited using the post editor, accessed from the dashboard Posts List display, or the QuickEdit icon on the blog face. Are relevant to the date when published. The URL of each post will always include the current year and month when published. Will display author, author profile, date, and / or time stamp - if selected, using "Configure Blog Posts". Can be scheduled, to publish in the future. Can be properly created with a blank title - though problems occasionally make the post editor malfunction when publishing posts with blank title. Can be created with a custom URL, when originally published. URL Duplication prevention for posts, especially considering "custom" URLs and post scheduling, is complicated - and has caused other problems with posts, and with their URLs. Can be created and maintained by blog administrators or authors. Dynamic pages are the responsibility of blog administrators and authors, alike. Can contain multiple blog articles, using label searches. A label search can also be used as a dynamic page. Appear in archive indexes, label searches, and main page displays. Appear in both blog newsfeeds - and in BlogSend email. Appear in the posts sitemap - and are routinely indexed as blog content, as individual posts. Can use "Jump Break" in a summarised index (archive, label, or main page display). In general, use of a page or a post, in any given scenario, is chosen based on the latter 7 details. When incorrectly chosen, we frequently see questions. How do I publish a page with multiple posts? How do I publish more than 20 pages in my blog? How do I add labels to a page? Now, examine the differences in real life. This blog article has been published as a "static" page. Click here, to see this blog article published as a "dynamic" page - and click here, to see this blog article published as in a special label search "dynamic" page (with "Jump Break"). Having read this page - and possibly, the complementary post - you are probably wondering what is the purpose for having two identical articles. And this is my real life explanation, to help you understand the confusion, between pages and posts. But the differences, between the two blog components, make the interesting stories.